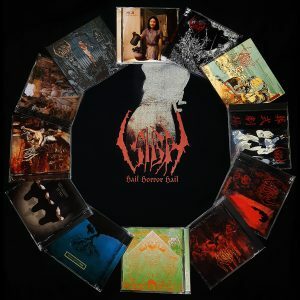 I guess you have heard us define the genres we talk about as «Satan's music» or similar names many times; I don't think there's too much to be amazed about, considering the monickers chosen by many bands. But this time we are not joking: the one I'm about to describe is with no doubt a record that comes straight from the house of the Devil himself. 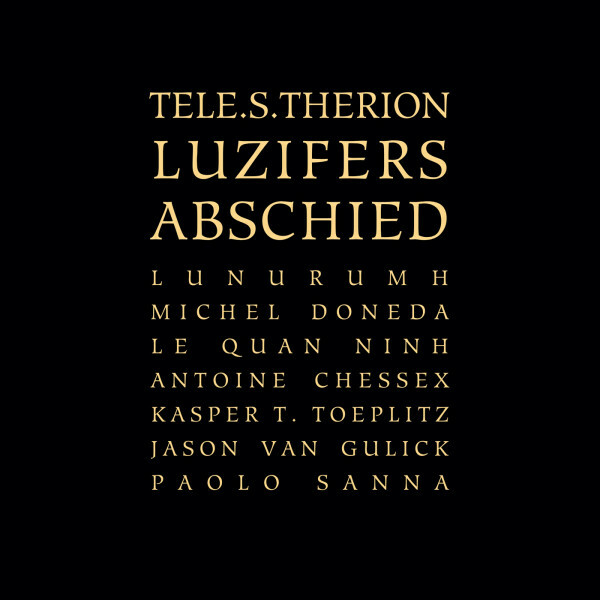 If you want to search for information on Tele.S.Therion, you'll bump into the names of Sandro Gronchi and Pietro Riparbelli (aka K11), but don't let yourself be tricked by the lies of the web: there's absolutely nothing human in the music contained in "Luzifers Abschied"; and even if there was, it would be from people possessed by unknown entities. Maybe it's thanks to an adorcism that the two musicians got in contact with the Devil and persuaded him to work with them: the communication with infernal spirits could have happened through a ritual so intense that the two masters of ceremony needed to request the help of seven guests — you can see them on the cover — which musical deeds are absolutely worthy of attention; however, one of them graced our webzine with his presence under false pretences with Chapter V: F10. 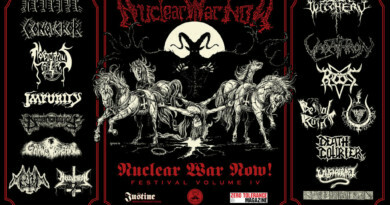 Perhaps you are asking what kind of music demons play and listen to, because the definition «Acousmatic Black Metal» could be not clear enough; but I imagine there wouldn't be many suprises if artists like Abruptum, Black Pentecost and Diamanda Galás — in her most diabolic performances — could be good bases for comparison, at least regarding the sound. Conceptually, in the acousmatic music the source of sounds that make up the pieces is hidden beyond an imaginary veil; hence, the mind of the listener, instead of visualizing people playing instruments as usual, will recreate a perception that comes from those sounds only and not from their actual source. This idea is in a great part bound to the base of the Musique Concrète, namely treating every recorded sound as a possible musical element, releasing it from the contest which gave it birth. 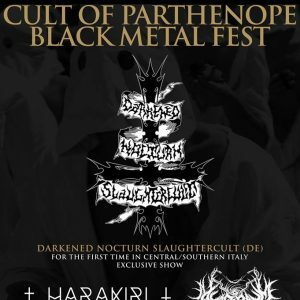 I'll avoid going too much into a details, but it's important to have at least some indication to understand what this esoteric «Acousmatic Black Metal» is: first and foremost, it is not Black Metal; at least not in its generally known form. Yet, the imagery created by the music of "Luzifers Abschied" is without doubt bound to the ultimate diabolic genre: the varied vocals appear through sick cleans and demonic shrieks, frequently overlapping on multiple layers and following the idea to spawn creepy presences everytime; the laments, the chants, the evil laughters and, in general, the inhuman voices are the elements that more than any other bind this work to the Black Metal genre. 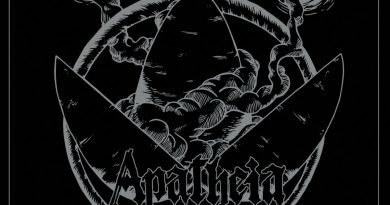 Don't get yourself tricked by the presence of a percussionist and a drummer: the conception of rhythm gets completely twisted and — even without blast beats and high speeds — the feeling that it is chaos which directs this orchestra is plausible. The rest, simply put, is pure atmosphere: talking about two saxophones (tenor and soprano), enharmonic bass, waterphone and synthesizers can give you an idea of how peculiar and well-thought the sound is, but at the same time it does not allow to show how much the songs are able to create hellish, ritualistic and deadly scenarios, with infinite variations that depend largely on the listener. Eerie carpets creeping into the meandering of the lower frequencies, metallic sounds related to industrial music, cacophonic distortions that sometimes hit like a thunder, sudden, abrupt and unpredictable appearances of woodwind instruments: this is the contribution of the instruments that — in a normal situation — should have done the melodic aspect, while in this case they are dedicated exclusively to the celebration of evil. 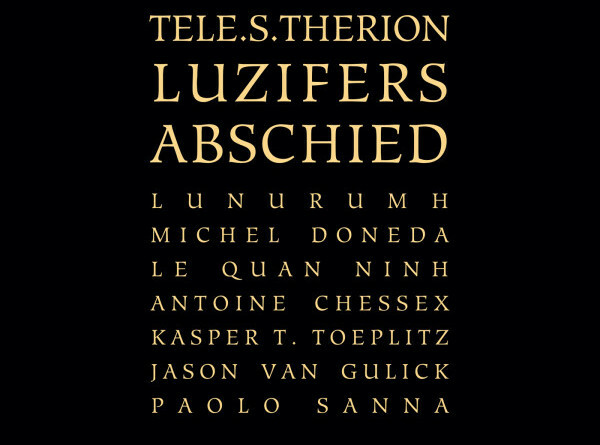 Among the influences mentioned by the band, there are legends of avant-garde music such as Edgard Varèse, Luigi Russolo and Karlheinz Stockhausen; the entire disc is, in fact, deeply linked to the German composer, in particular the "Licht" cycle as the Saturday work closes with an act entitled "Luzifers Abschied" which clearly inspired Tele.S.Therion to create their own concept album. Atonality, improvisation and experimentation are undoubtedly known to the duo who clearly studied the lessons given by their masters and applied them to a Black Metal context, still maintaining some points in common with the original Stockhausen's composition, especially in the vocals. Keep in mind that a work like this needs a theatrical element to be successful, so don't expect a real demonic ritual, but a sensory representation of it in sound form. 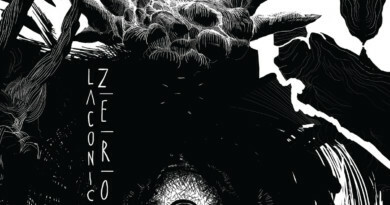 That said, "Luzifers Abschied" could be considered difficult to those accustomed to Black Metal, because it is musically distant from the standard; on the contrary, the most daring listeners and lovers of the most experimental and atmospheric drifts of the genre, will have a whole world to explore: they will only have to create it through their own experience.